Oh the shenanigans we would get into at work! I didn't realize it had been almost 5 years since I had seen Heidi & I'm so glad we were finally able to get together for lunch at Bread & Cie before I had to head out of town for the weekend. We caught up on each other's lives and reminisced about the past. And we laughed...a lot. We had almost forgotten that we had a goofy golf course set up around the office, played online wheel of fortune during lunch hours so often that we could guess the puzzles before any letters were up, and sent a tacky gold reindeer to our boss for his birthday while he was on a business trip in China. But distance can not separate our crime spree and we've sent pieces of that reindeer back & forth to each other for a surprise birthday or Christmas present to each other for the past 5 years. I fear the reindeer that we held onto for so long is now gone as we partnered up this Christmas and sent it right back to our minimalist former boss who I'm sure threw that nasty thing straight in the trash. It's not the first time that thing has been in the trash as we had to retrieve it once before after it was haphazardly tossed away! Aaah, good times. Whatever we were doing at work it usually either involved a lot of stress or a lot of laughter and I must say, I think laughter is one of the best parts of living! Out for an afternoon of test runs with good friends. You never know what you'll come across in this great city of ours! While playing host & hostess to visiting friends, Tom & Corrie from Colorado, Corrie and I, who are always up for random adventures, made our way over to Shelter Island to view these 2 tall ships. "Lady Washington" (famous for being in the movie, "Pirates of the Caribbean: The Curse of the Black Pearl") and "Hawaiian Chieftain"(a replica built in 1988) are currently docked in San Diego for touring. Throughout the weekend, the 2 ships will be engaging in mock battles on the San Diego Bay. We were just lucky enough to catch them practicing the day before and although we didn't get to hear the cannons boom or the puffs of smoke pouring forth, seeing these ships up close, I sure have a better appreciation of what a sailor's life was like! Yesterday was the big day! We drove the 2 hours to the middle of the desert to pick up our new Trophy Lite Race Truck. Yep, my husband, the jack-of-all-trades, will be racing this little beauty. In the day and a half that we've had it, I've had all sorts of questions thrown at me. Everything from the typical, "Are you scared for his life???" to, "What color is it? "( Ah yes, the important questions in life!) Here's what I do know about it: The current color is white; it soaks up bumps, holes and whoops like a champ; it rides like a Caddy; the wife was too scared to drive and crash it on its first maiden voyage and it's already held 8 friends and family members in it's passenger seat. And if I can get mushy and girly for a minute while talking about a race truck, it is the support of friends and family members that is making this journey into new racing territory an exciting and fun adventure for the both of us. We look forward to everything this next year holds for us, may it be big or small. As we were towing the truck from it's "birthplace", El Centro, to it's first test run in Plaster City I commented to Sean that we have a very good life. It may seem to some that we do a lot of grandiose adventures and have taken up some dangerous sports, but above all, we are thankful for our relationships in life and are thrilled that our diverse activities have allowed us to meet so many amazing people. So add racing to the list of Lorenzen activities and we look forward to seeing your face in the crowd cheering us on, or on our crew, doing the dirty work! One of the reasons I love vintage items is because they are a preservation of pieces of the past. 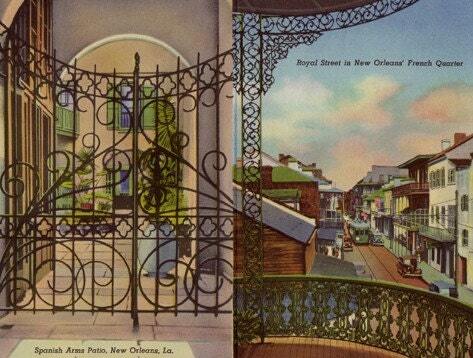 Currently listed in my etsy shop is a vintage postcard souvenir folder of some gorgeous illustrations of New Orleans. I was looking through them I wondered what still stands and what has been ravaged by floods. The ironwork and architecture in these 2 particular illustrations caught my eye - such charm and intricate detail! Perhaps I should add New Orleans to the ever-growing list of places that I need to visit! I'm learning to like winters a little bit more, especially after our excursion to Colorado where we got just a hint of what life is like when the seasons really change. 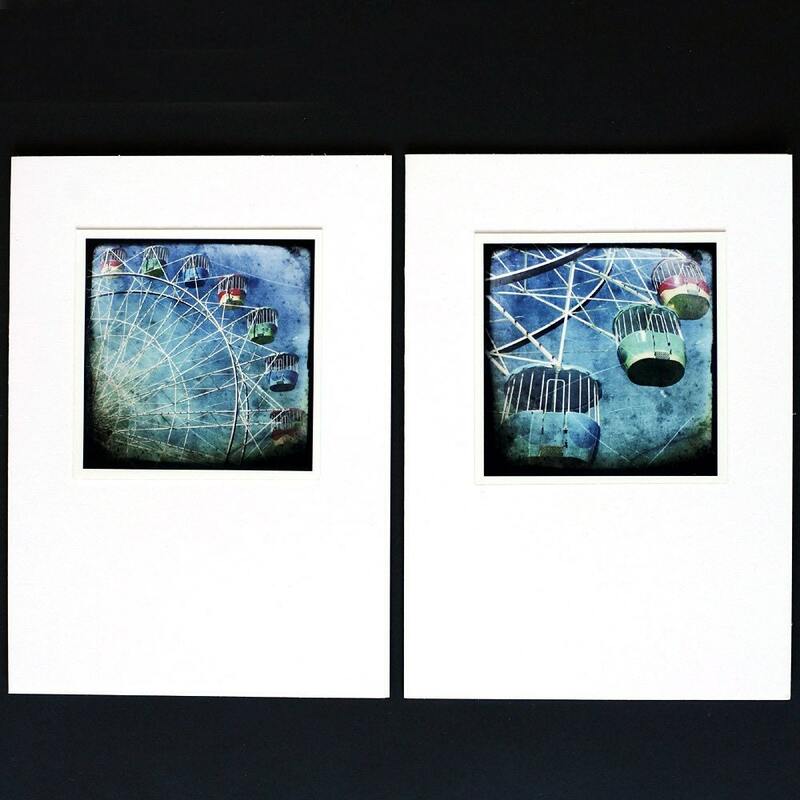 But on a dreary, rainy day such as today, I do long for summer again and I appreciate these 2 notecards of a simple amusement ride on a day full of sunshine. I'm loving the vintage appeal of these cards lovingly created by jackiecooper. Be sure to check out the other photography in her shop for a slice of Australian summer during the middle of our winter! With this combination of Vintage Zoological Postcards from my etsy shop and these Organic Animal Print Jacquard Towels from West Elm, you won't have to leave home to feel like you're in an exotic locale! With the variation of colors in the towels, the postcards would look great framed in a natural wood color (to complement the giraffe towel) or a dark espresso color (to complement the snow leopard towel). Just replace your towels, hang up the postcards and add a few accessories for an instant retreat! Growing up in the desert Southwest, I have an appreciation for its beauty. These Vintage Postcards with illustrations of the Yucca plant and Saguaro cactus would look simply perfect framed and hung on a wall. These Southwest beauties can be purchased in my etsy shop. Exit, wife - Enter cute brown puppy! I just can't match up to the cuddle factor! And this would be my sassy look! Happy New Year, everyone! I'm looking forward to what this year holds and felt I needed to start it off right with a new banner. Thanks, Missi, for these gorgeous shots! Have you ever seen anything more awkward looking? She's still figuring out how to grow into those longs legs!